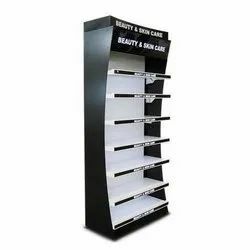 Manufacturer of a wide range of products which include cosmetic display stand. we are manufacturing beautiful range of Cosmetic Racks. These racks are used to display cosmetic items in retail stores and other commercial areas. These are manufactured by our trained fabricators using best quality raw material and latest technology. These racks are designed to give a glimpse of cosmetic range available with eye-catching designs. The complete collection is available in various colors, trendy designs and sizes in order to fulfill the demands of our clients. Cosmetic Racks have glass shelves that make the products to be viewed easily without touching. Looking for Cosmetic Display Stand ?